I was hoping to have some leftover xa xiu from the hu tieu because that will give me a chance to make more food. 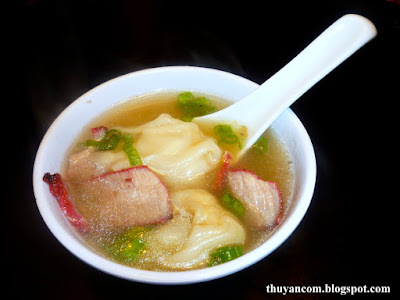 I've been wanting to make some wonton soup for a while now because I love getting them at Chinese restaurant. One of the places I've eaten at actually use xa xiu in their wonton soup so this works out very well. I like wonton soup because it's light yet filling to eat. Some are made with a subtle chicken broth while others are flavored with the fragrant sesame oil. I particularly love the buffet version that has a hint of soy sauce. I made a pork broth since I still have extra bones but I'm sure chicken broth will be just as good. Nothing beats homemade soup so enjoy! 1. Rinse bones with plenty of salt. 1. 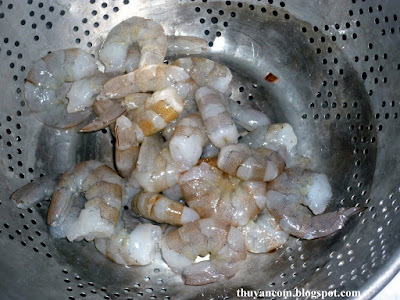 Cut the shrimp into smaller pieces. 2. 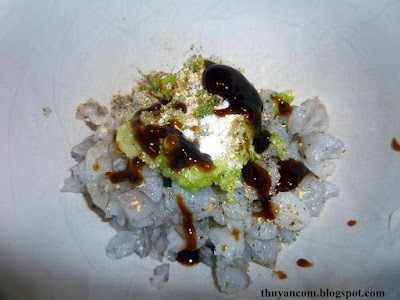 Add the dry ingredients, oyster sauce, and green onions to the shrimp and mix. 3. 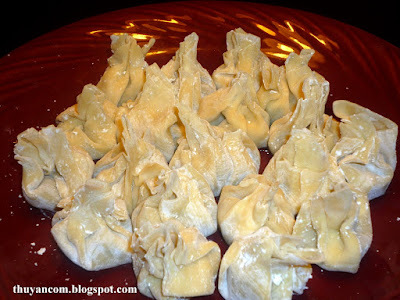 Scoop a teaspoon of shrimp mixture to a wonton wrapper. Bring all the corners of the wrapper to the middle and twist. 4. Add to the broth to cook. 1. Pan fry the prepared xa xiu. Sliced thinly and add to the bowl before cooking(avoid adding to the soup while still cooking because you will lose some of them yummy flavor). 2. Chopped green onions for garnish.